What’s going on with Sarah Carlin?! Photo Credit: Sarah Carlin, Sarah and her friends (L to R- Tsethen, Ugyen, Norbu, Zam, Tshering and me) at the school picnic. LADIES I MISS YOU!!!!! Sarah Carlin became a teacher to the lucky students at Bjishong Middle Secondary School in 2012, and taught grade 7 and 8 English. During her time in Gasa; in addition to a full load of teaching, she spent time writing and drawing; her drawings even became weekly or bi-weekly treats for her classes (if they behaved! ), and her students loved “to be looking at Miss Sarah’s drawings”. ~ Reflections…the first of many. It is certainly crazy to believe that I have been out of Bhutan for 9 months. Sometimes it feels like I left only yesterday, and sometimes it feels like it was all a dream. But, life at home is slowly becoming more normal and I suppose that’s a good thing. Originally it was very hard to get back in the swing of things – of North American life, but having been back for awhile it is all becoming easier. I am so lucky to have such supportive family and friends who are understanding of why a menu takes me 20 minutes to look through because there are just too many choices, and yet I still complain how nowhere has the one thing I really want to eat, a steaming bowl of ema datsi. I am now living in Buffalo NY…and I teach pre-K. I really love it, and like to tell my students stories about my year in Bhutan, and what Bhutanese children are like. Because they live so close to Canada, my students can comprehend the idea of a different country, but they can’t comprehend how different Bhutan is. Neither can I, on some days. We’re so glad you are enjoying your new teaching career! 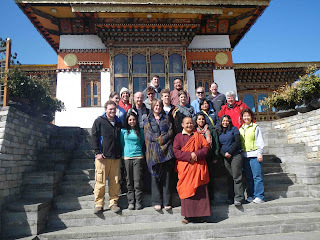 Photo Credit: Sarah Carlin, “Our batch of BCF teachers at Dochula. This was the last time we were all together, and I am thankful it was such a beautiful, special, unforgettable day. Martha, we will never forget you, and may you rest in peace”. Bhutan affects all aspects of my life on a day-to-day basis, but one aspect that is in the forfront of my mind is appreciation for the scenery around me. While in Bhutan, I was in Gasa, and although I am a biased source, I truly think it is the most beautiful place on earth. I woke up every morning looking at mountains out my door, and peering down into low river valleys on my walks. We had red and white rhododendrons which gave some pops of color to our green, green forests, just like the few and far between houses gave some varience and perspective to the rice paddies beside them. Coming back to normal America, I was rather depressed at the scenery for awhile. But I remembered how much my Bhutanese friends appreciated their surroundings, not because they were particularly beautiful, but because it was their home. And so when I am driving to work, or walking around town, I try to do the same. So, thats what I try to do here. Its certainly not the same, but I can appreciate a beautiful garden or leaves changing into beautiful colors the way I appreciated himalayan mountains and rhododendrons. Thank you Sarah for your wonderful contribution to BCF. Read more about her experience at her blog Sarah’s Travels and Adventures! Continuing on with our segment Update from an Alumnus, we are excited to bring you an update from 2012 BCF teacher Aurelia “Reidi” Smith! Reidi spent a year in Bhutan teaching English to students in grades 7 – 9 at Autsho MSS in the district of Lhuentse. While in Bhutan, along with teaching a full schedule, Reidi helped improve the library with a School Development Grant from BCF -> Stories from the Field – Library Improvement. Currently, Reidi is in Korea teaching at Cheonan Technical High School in the city of Cheonan and we enjoyed reading about her recent experiences with everything from a new home, school, and food at her blog entry Wash and Repeat! My school is 95% boy. It is the biggest school in the entire province (over 1,500) and the best technical high school in the whole district. I teach 7 classes of “regular” English during the week, with 4 different co-teachers that vary in style and commitment. Additionally, every day, I teach an Internship Class, from 4:50-7:50 p.m., that is preparation for a platform which will, hopefully, prepare those chosen students for an actual real-life chance to go to either the U.S., Canada, New Zealand, or Australia to work as interns after they graduate. Photo Credit Aurelia Smith – In front of my school, Cheonan Technical High. The campus is huge. I can’t say that I feel necessarily homesick, or the separation anxiety that I did last year. This is not to say that I don’t think of the people who are reading this and yearn to share these visions and moments with you every single day; but I have brought you all here with me. I look at it this way: I won’t compare Bhutan to this; I can’t. Apples to oranges. But I can say that, when going to Bhutan, I was hoping/assuming that I would magically trans-morph into a certain type of person, simply by osmosis. The time I spent at my home in Nebraska in between Bhutan and now, though not felt or seen as that at the time, added to what I felt and experienced in Bhutan and prepared me for this. I am now fully open, ready, and receptive to all this newness, and I can’t say that was the case in my previous experience. Running the risk of sounding redundant, again: I am so open, grateful, and aware of the blessings that are being bestowed on me now. I feel that life is gifting me in such big and small ways. And with this recognition comes the mitigated sensation that I’m cashing in all my chips at once, inadvertently so. So I hope I can do enough to give back. Because I feel vibrant; I feel vital; I feel I am who and where I should be right now. I am thriving. 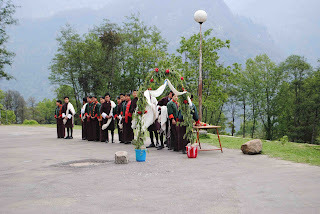 Read more about Reidi’s experience in Bhutan at her blog Himalayan View. Introducing our new segment – Update from an Alumnus! Since 2009, The Bhutan Canada Foundation (BCF) has been working in collaboration with the Ministry of Education in Bhutan to recruit highly qualified native-English speaking teachers to work in public schools across the country, where they help to address a teacher shortage of nearly 1,000. BCF teachers have an incredible impact in the classroom where they encourage English language literacy and comprehension and bring problem solving, critical thinking, and innovation to the forefront of educational practice. BCF Class 2010, 2011, 2012, and 2013! Over the years, our BCF family has grown substantially from six teachers in 2010 to 20 now currently in the field. And that means our alumni network of teachers is expanding and BCFers are now teaching all around the world, sharing the experiences and knowledge they learned in Bhutan to new students and colleagues. Our alumni have moved on to new and exciting adventures – from teaching positions in places as varied as China to northern Alberta, to travelling the world, becoming involved with international non-profit organisations, or going back to school to further their own education. We’re thrilled when we receive updates on what our teachers are now doing and we’re happy to be able to share some of their experiences post-Bhutan here! BCF alumnus Dave Green, spent a year in Bhutan teaching physics to grade 9 and 10 students at Pakshikha Middle Secondary School in Chukha in 2012. He was an integral part of the community and while teaching a full schedule in Bhutan, Dave also busied himself with a successful music club! Upon leaving Bhutan, Dave spent five months travelling in Asia. Amongst other adventures, he partook in a week-long writers retreat to finish his novel (nearly done!) and reconnecting with his family. Currently Dave has landed a job teaching Physics at one of Scotland’s top private schools and he’s looking forward to inculcate some Bhutanese-style values with his students! Below, he was happy to share some reflections of his time spent in Bhutan. Now that I’m finally moving on to something concrete and ‘jobby’, thoughts are more than ever turning towards my time in Bhutan to try to figure out what it all meant to me and how I feel about not being there anymore. I have to say that my memories are pretty much all good ones. There were frustrations, but that was inevitable, and they only served to bring me on as a person. Most of the time it feels a bit like a dream and I have to focus on it hard to bring it back and make it real. Without a doubt the best year of my life, with wonderful friendships, brilliant experiences and such warmth and generosity everywhere. I almost stayed, as you know, but it didn’t pan out. I hope that in the future my relationship with the country and the people I met there will renew and develop – I hope to return. Thanks for sharing Dave and we are excited to hear how your experience is at your new school. Good luck with everything and keep in touch! To read more about Dave’s experience in Bhutan and beyond check out his blog -> The Bhutanical Adventures of Dave Green.